I am coming back with popcorn for the comments. No one take my seat. Further proof that wearing designer gear head to toe doesn’t make you stylish and that money can’t buy you class. I’m honestly trying hard to understand this. I’ll come back here and check again. I just realized that there are 2 Chanel bags with that white outfit. Hahahahaha. That seems to be the latest trend. Although I don’t see any normal human being – outside of the Insta/Fashion world wearing this type of bag. It makes no sense! Natasha looks like a Beverly Hills homeless person. I am being kind and generous here. Only they wear all their possessions on their body, sadly. Glad that you guys have admitted what your readers have been saying for a while; that she is losing her fashion mojo. And not tried to defend the indefensible. Too much money and to little to do, makes Natasha go crazy in the Chanel and Gucci stores! Ok forgive me but the urban dictionary has a term for this – LABEL W*O*E. Had to bleep out the whole word because of language sensitivities. Well, money can’t buy taste, aesthetic or class. Lol – I literally laughed out loud at her double Chanel bag (s)!! I sooo needed to see that image today :) … it is just way tooo hilarious!! P&P, is the double Chanel bag sold as one piece? It looks like she has a link to it and isn’t merely carrying two separate bags, but I couldn’t find any such design online. Yup, it’s sold as one item and they are called side-packs. Added a link to them in the post. If you go back to the earlier years of this blog, you will find that Natasha was one of the very few who stood out well for her style while her socialite peers regularly appeared in Herve Legers dresses with Bottega clutches and most of Bollywood looked clueless. 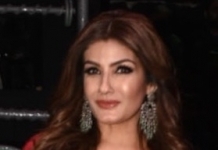 Now, Bollywood brigade has found what works for them and unfortunately Natasha looks like a cookie aunt who used to be cool and now looks like heera panna version of Anna Dello Russo copy who epitomises Bollywood’s obsession of brands, singular pose and posse. Sad. Gucci is too overhyped. I never liked their outfits. And print on print? This needs to go away immediately. I cant decide, which of the two looks is more hilarious. Comical, Non-sensical and merely display of wealth. This is what happens when you have tooo much of wealth and don’t know where to use. I wish there were ethical and compassionate materials for the accessories in fashion. All that money and so little taste….sigh! This is beyond comical and beyond salvage. Not just losing her mojo, more like she’s losing her mind. I seriously think Kareena and Natasha are manoeuvring their respective mid life crisis by going bonkers with fashion. Cannot comprehend any of these outfits. I agree with the comment above that there was a time when Nat P used to stand out for her fashion among the try hard Bollywood and socialist. This is back when ‘stylists’ were a rare species. Now – everyone is dressed all the same and Natasha’s looks veer into “What!!? ?” territory as she tries too hard to be avant grade. On another note, does Gucci have a year end sale that we are not aware of as half of Bollywood is seen sporting the brand these days. I get it that this is a way of brands to gain prominence in new markets but seriously Bollywood, change it up a bit. Fashion victim meets train wreck! Kangana wore a similar print jumpsuit with lace-up platforms with way more aplomb. Putting Kangana aside Natasha is more like sarcasm. One gets it perfectly right always the other misses it by a mile. Ha haa…’ love the separates?’ ! Time to call out lack of taste . Chuck your Bias, P&P.. Is it one of the reasons you have not posted Sonam’s tacky look from Hello awards! Go back and check older posts, she has already been covered. The first Gucci blue flowers print reminds of a curtain fabric my mom was fixated on buying 15 years back. I stood my ground and we did not buy that. did not like it then…dislike it even more now. I wonder my fashion sense is doomed or Natasha Poonawalla’s! I wonder if its a conspiracy by the gossip gang to make Natasha feel that she looks beyond stunning in these clothes. Sad!! n hilarious!! this makes me hate designer stuff! She’s not invited to my birthday dressed like that. I have money and I am gonna shop everything B|RAND has to offer which shows “I have money” , cause the money I have need to be shown some how to others who have money ! That’s what this looks feel like. Such pretty face and figure to use it for this .. Alas ! Hahahhaha!!! I can’t believe anyone would voluntarily wear 2 bags on both sides! Most people won’t even if they get paid for it. Thanks P&P for this wonderful post. Am gonna grin my way through the day now. Holy S*** those are earrings, i thought it was a fur collar. But to be fair to her, there’s a guy in a quirky suit next to her so let’s assume its a theme! That’s actually an insult to Ranveer Singh! The whims of the rich and famous! This is one hell of a “Chanel and Gucci made slush vomit on a person”. And P&P thin line between whimsy and delusion.